Developments in fintech are driving new efficiencies, enabling firms to streamline their operations, redefine their processes and transform the customer experience through innovation. According to PwC’s 2017 Fintech Report, 82% of firms in the industry expect to increase fintech partnerships in the next three to five years to innovate and integrate emerging technology into a production system or process. 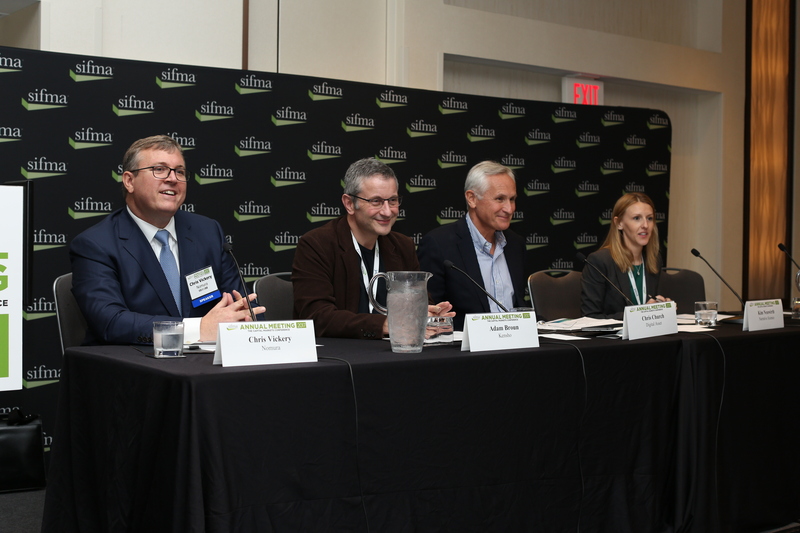 On the fintech panel at SIFMA’s 2017 Annual Meeting, The Capital Markets Conference, Chris Vickery, Nomura’s Managing Director and Chief Operations Officer of the Americas, led panelists through a discussion on the leaps in operational processes and what’s next for blockchain, artificial intelligence and more. Today, most of the industry’s initiatives in blockchain or Distributed Ledger Technology (DLT) are in the proof-of-concept stage and while regulators see tech innovation in a positive light – including the U.S. Securities and Exchange Commission with its focus on fintech – a productive dialogue with regulators is important, particularly when addressing the challenge of governance and privacy. Adam Broun, chief operating officer of Kensho, a machine learning and data analytics firm, said that although there are challenges, “firms should take more risks than they used to and be more willing to engage” with these new technologies. Panelists describe how fintech is reshaping the financial industry, the challenges that must be addressed and what the future holds for the sector. “You have to be careful about blockchain claims. Are people referring to it as using blockchain or producing it?” said Chris Church, Digital Asset’s Chief Business Development Officer. Kim Neuwirth, Director of Product Management at Narrative Science, stated that “in some cases, regulators are the early adopters.” Across the industry, fintech has seen a lot of growth in providing new approaches to facilitating compliance reporting, bringing operational efficiency and full transparency, but the challenge in implementing emerging technology is governance: what does a successful implementation of an emerging technology look like? The challenge of a successful fintech implementation is not necessarily about IT. As Satya Pemmaraju, Founder and CEO of Droit Financial Technologies, described, “The issue is organizational and cultural: how is decision-making handled across an institution?” Business models are shifting, from transacting and complying – to keep up with the complexity of a global marketplace across all jurisdictions – to more intelligent, cross-entity operations. When asked about the future of fintech, Chris Church says of the progression of DLT, “in a year or two, we won’t be talking about the benefits; it’ll be a cost-savings play. Over time, firms will build their own DLT application and it will evolve and become a revenue-generating technology.” Kim Neuwirth said that people will spend less time interpreting data as language-generation technology will be used to produce narratives for research, performance, and compliance reporting. On artificial intelligence, Adam Broun explained that AI is about enabling firms, advisors and their clients to focus on what they care about. Charles DeSimone is Vice President, Technology and Operations. Chris Killian is Managing Director, Business Policy and Practices. Thomas Price is Managing Director, Operations, Technology and BCP.